In 1990 Nelson Mandela was released from prison. I was ten years old. I remember thinking about him a lot at this time. I questioned why he was sentenced to prison for wanting fairness, freedom and opportunity for all people in South Africa. I wondered how he had coped imprisoned for 27 years, nearly three times my whole life over. To me, it was incomprehensible. His release from prison was celebrated throughout the world. I was intrigued and fascinated as he went on to receive the Nobel Peace Prize in 1993 and then became President of South Africa in 1994. He remained an extraordinary and much respected man until his death at the age of 95 in 2013. One thing I hadn’t ever considered was Mandela’s earlier life. He came out of prison already a silver haired gentleman at 72 years of age. It was only then that photographs of Mandela were once again allowed to be published, so it is Mandela from that day forward that I remember. 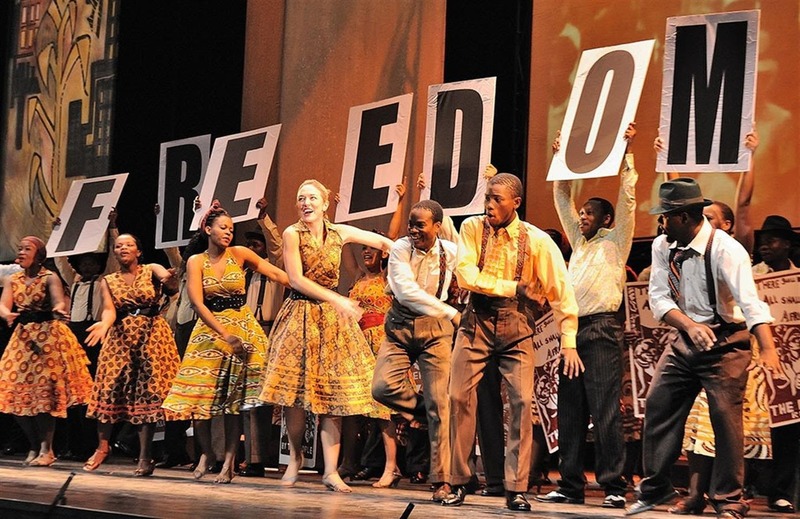 That is until now, watching the fascinating Mandela Trilogy, performed by the Cape Town Opera, at Wales Millennium Centre of which two thirds of the show concentrate on these early years and give us an insight into what made Mandela the man the world came to know in their present day. 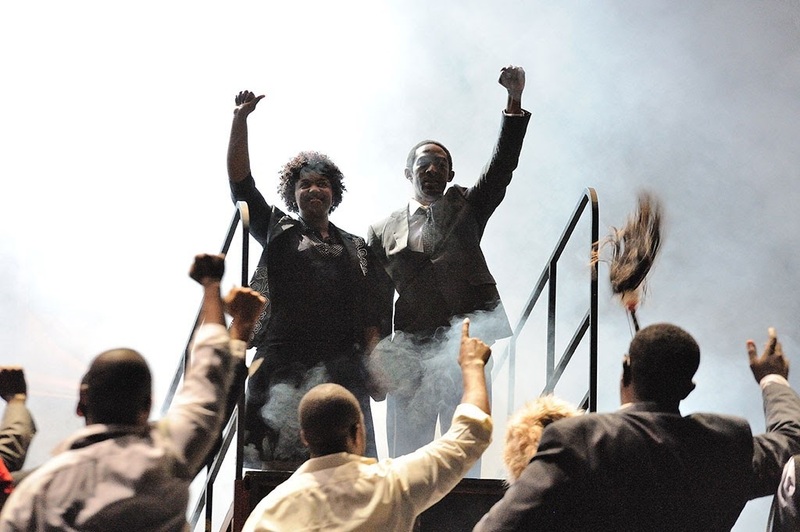 This “second coming” (the Mandela Trilogy staged it’s European premiere here in 2012) is a co-production between Cape Town Opera and Wales Millennium Centre, and celebrates the centre’s ten year partnership with Cape Town Opera. Graeme Farrow, Artistic Director, and all at WMC are “delighted to be continuing” their “close friendship with Cape Town Opera”. 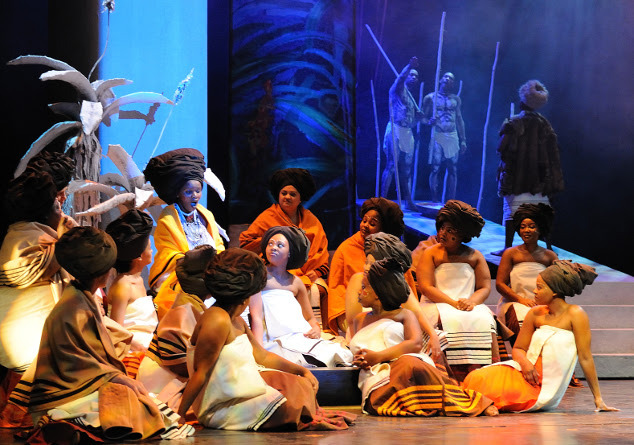 Act 1 gives us an insight into Mandela’s early tribal years and the traditional customs and rites of passage at that time. Peter Louis Van Dijk (the composer of Act 1 and 3)’as traditional Xhosa initiation songs, drumming, dancing and stick fighting set the place and atmosphere in this scene. We understand how Mandela was inspired by the first freedom fighter, Makhanda and how his leadership skills were nurtured in the Thembu tribe. Thato Machona plays the youthful Nelson Mandela and Lukhanyo Moyake plays his cousin and childhood friend, Justice. We cannot help but smile as these budding young men, full of life, run away from their village to risk arranged marriage and go to the big city of Johannesburg. 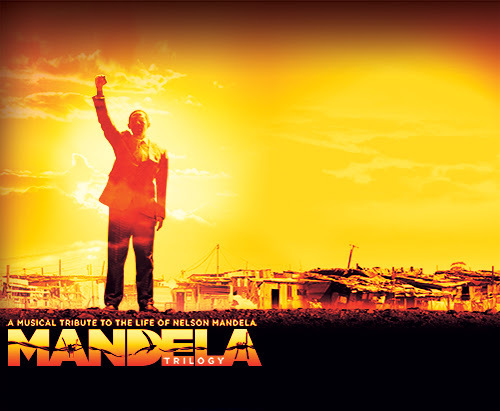 In Act 1 we see Mandela grow from a boy into a man and the start of his independent journey. For me, act 2 is where the Mandela Trilogy comes to life. People ask if this show is a musical or an opera. The conductor, Tim Murray, replies, “it is possibly both or neither.” One thing for sure is Act 2 contains the most “musical” style numbers. Mike Campbell composes the score to represent this time in Mandela’s adult life. Mandela 2 is charismatically played by Peace Nzirawa who gives a captivating performance of “Freedom in Our Time”. His unique baritone voice makes it just as enjoyable listening to his dulcet tones giving a powerful speech as performing his wonderful singing. 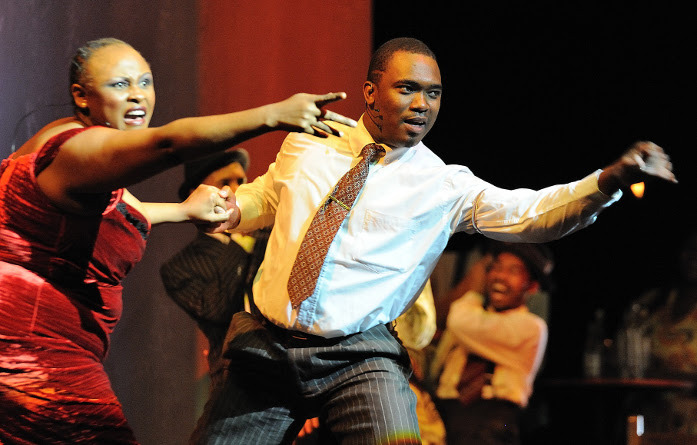 My favourite number in Act 2 is Pata Pata (originally released by Miriam Makeba in 1957). This is performed with gusto by Dolly ((Candida Mosama),a Jazz Singer and Mandela’s lover; along with Mandela (Nzirawa) and Evelyn (Pumza Mxinwa), Mandela’s first wife. It is rousing and catchy and the onstage dancing is hip-swingingly mesmerising (I wanted to join in). Another number of note in this scene is Meadowlands, a poignant protest song about people refusing to go to the Meadowlands, disguised as an upbeat, cheerful jazz song to confuse the white government officials at the time. In Act 2 Nzirawa really delves into Mandela’s character and shows us how the tribal boy grew into an important man. It conveys his move to into law, politics and as a man of the people. In addition to the everyday struggles of imprisonment for so many years Mandela had to deal with the heartbreak of the death of both his mother and first born son. He was not allowed to attend their funerals. While Mandela once dryly joked that “(he) went for a long holiday for 27 years”, these were undoubtedly the hardest parts of his prison stay. Mandela and Winnie (Philisa Sibek) sing the powerful “Dream Duet” which highlights their struggle and how they have grown apart. When Mandela was first taken to Robben Island he was told, “This is the Island! Here you will die!” But thankfully, that wasn’t to be. Mandela was released. The show ends on a powerful climax with the the roaring finale, “Time Has Come”. Apartheid ended in 1994, yet Mandela’s story is still as relevant today. “We are so terrified of the movement of people” says Michael Williams. In some ways, we seem to be going backwards not forwards as a human race and the lessons of Mandela should always be remembered. 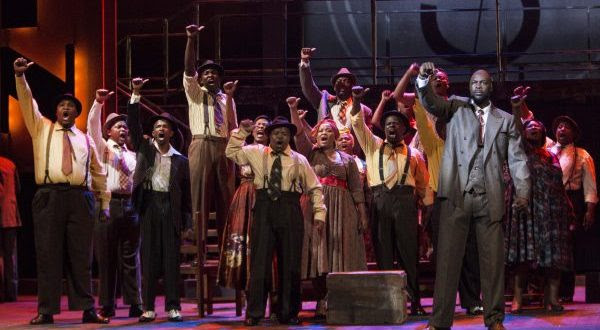 With this collaboration with the Cape Town Opera, Wales Millennium centre is keeping it’s original vision of “bringing the best of the world to Wales” and also educating. I wouldn’t say that the Mandela Trilogy is the easiest musical opera to watch but it’s certainly an important and enjoyable one! I left with a thirst to learn even more about Mandela’s life (I have ordered his autobiography) and a desire to hear more original South African music from the 1950’s era. Age guidance 10+ (No under 2s). Try and catch it where you can! WMC and CTO are currently collaborating on another exciting production, Tiger Bay, which will open in Cardiff and Cape Town in 2017.